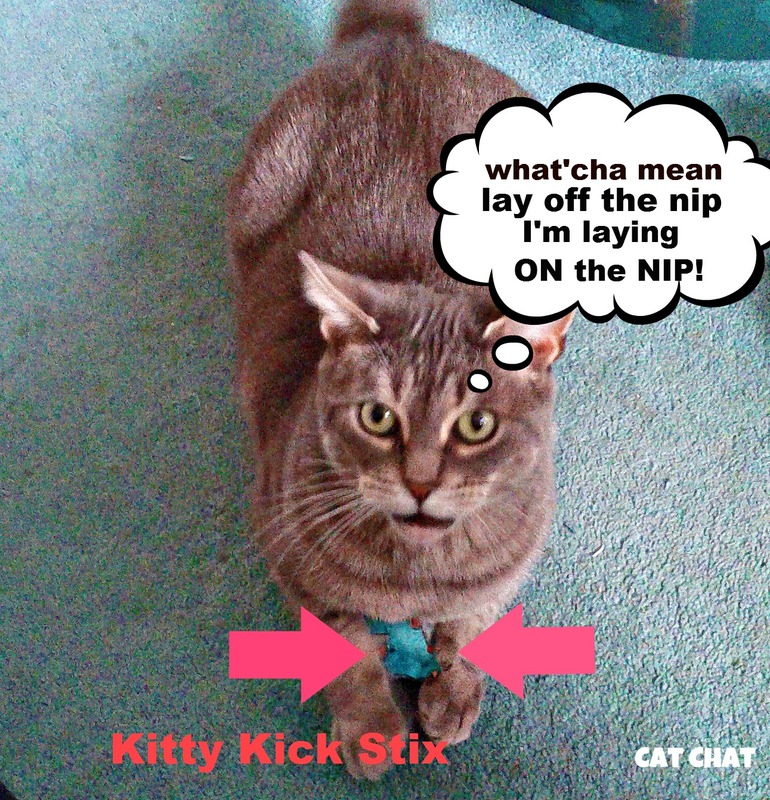 Cat Chat With Caren And Cody: Kitty Kick Stix! Hey everyone! You gotta check out my new toy!! It's called the Kitty Kick Stix and let me tell ya I had one wild time playing with this one! It's the ULTIMATE CAT TOY! It's a whopping 15" long! That's long enough to do some heavy duty bunny kicking! You can wrassle it, hug it and the best part? 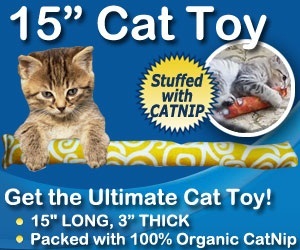 It is packed with 100% ORGANIC CATNIP!!! This is some potent stuff! 100% Organic and Chemical Free! 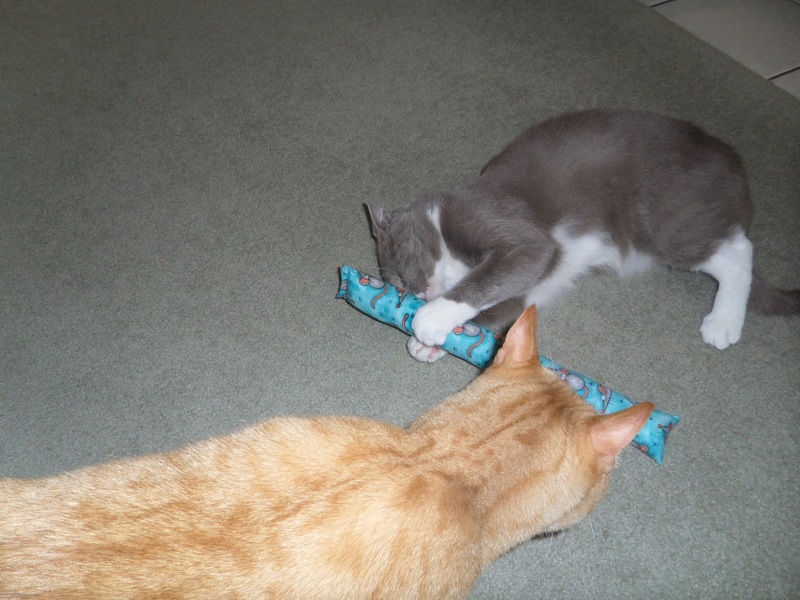 The kitties below are playing with the same Kitty Kick Stix that I received! See how long that is? It stands up to some MAJOR BUNNY KICKS! I am lovin' that organic nip! 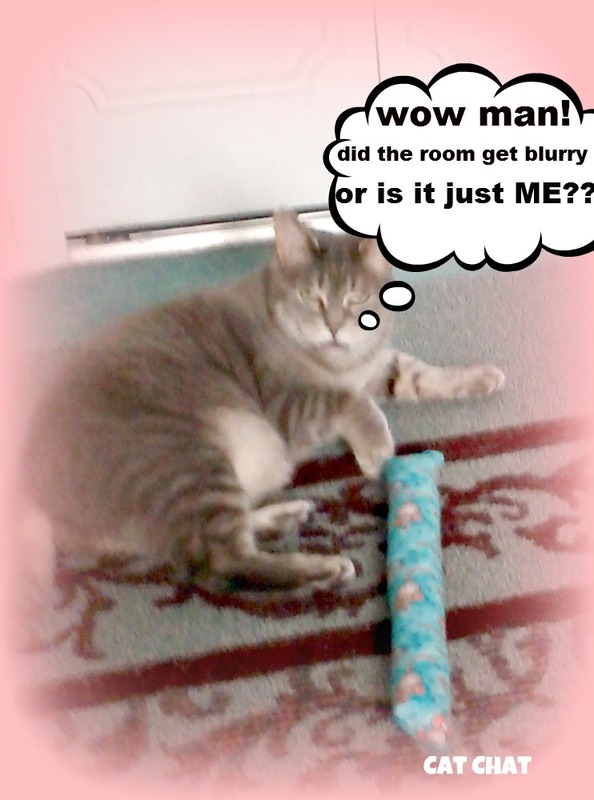 To order your Kitty Kick Stix click here! I was not compensated for this post. I received a Kitty Kick Stix to test and review and I couldn't be happier! Hope you try one too! haha! Cody, you sure look like you're protecting your stick! ...and that last kitty is clearly in need of a 12 step program! Let the bunny kicking begin! Those look awesome, Cody! I wonder if we could all play with one, or if that would lead to smacky paws? Hey I'm all for a bit of fun but whats with the bunny kicking?Any way cody loks like you're having a good time so keep with it! I thought your best toy was Dakota, Cody! 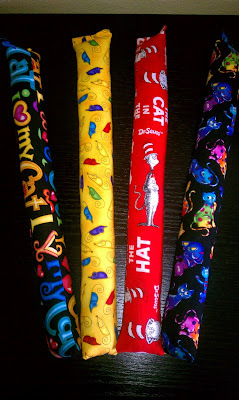 The Kitty Kick Stix look really interesting and they look like bolsters too. Might be useful at night!! You get to test the best toys! We're soooo jealous! Those Kitty Kick Stix sure lookes pawsome ! Love the fabric choices for the Kitty Kick Stix. Good job on the review! Wow Cody....you look like you're higher than a kite (!) AND enjoying every minute of it. That's one heck of a kicker there - you'll be enjoying that for a long time to come!!! WOW! What a great looking toy! Thanks for the referral pal. That does look like fun stuff. @Mario it is super big and that is why I love it! The fabric is sooo cute too! @Old Kitty MOL! MOL!!! Love to you and Charlie! @Nerissa it is sooo much fun! @Sammy oh yeah...I was pretty buzzed! Won't find me DRIVING like that!! MOL! @Kjelle Bus let me know if you do! Would love to hear what you thought of it! @Sparkle it might but that would be oh so fun to watch! @Benny and Lily I bet your kitty friend would love it! Kitty's must really love this one!! Love the "Cat in the Hat" one! Looks like Cody kind of over did it! LOL! That sure looks like such a fun toy and two of us could play with that together. Like Maggie and Mahoney. Thanks for the great review Cody. Take care. Me is a CatNip girl, me has to get me one of these! I think I would get a kick outta that too! Cody, when I've been sniffing the nip or valerian, I feel just how you look! I love to bunny kick and when I'm high I will bunny kick anything, even my less than 2 inches long mousie when it has been marinated. How is your mum feeling now Cody? We hope she is feeling better than she was and doesn't have to wait too long to get those nasty ole stones seen to. Those look incredible only I don't like toys that are bigger than me or big at all. One of the cats who came before me was a stray that TW found and was trying to make into a house cat. 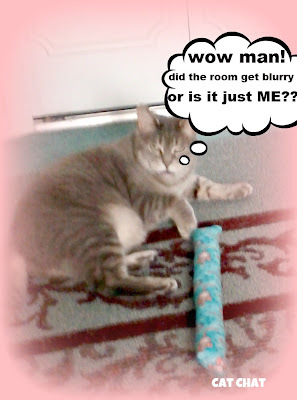 Sissy loved her long cat toy, which TW called a baseball bat. Then one night she frew up all over it and that's when TW realized she was PREGGERS. HAH! That looks like a pawsome toy! Everyone here would love it, too! The fabrics are cute as well. I ordered the kitty kick stix in September and still have not received them. My cats are upset since I told them a new toy was coming in the mail. Does anyone have a phone number to contact them? I emailed them and have not heard back. Dear "Anonymous" I am surprised to hear that. But...if you click on their name in the first sentence of the blog I linked it to their website and you should find contact information there.